The "heart" on Pluto is and other surface details are clearly visible in this stunning false-color view of the dwarf planet captured by NASA's New Horizons spacecraft this month. NASA unveiled the image on July 24. The mysterious face of Pluto is beginning to yield some of its secrets in this stunning false-color image from NASA's New Horizons spacecraft, which scientists can use to detect subtle differences in the dwarf planet's surface, including its icy "heart." The new image of Pluto, released on Thursday (July 23), clearly shows the now familiar heart-shaped region nicknamed Tombaugh Regio. The photo is actually a combination of observations from the main camera on New Horizons (called LORRI) and the probe's visible/infrared imager (known as Ralph) which provided data for the colors in the view. The enhanced colors allow scientists to identify differences in the composition and texture of Pluto's surface, according to a NASA image description. The New Horizons spacecraft captured this view in the days leading up to its historic July 14 flyby of Pluto. At the time, New Horizons was about 280,000 miles (450,000 kilometers) from the dwarf planet. Four images from the probe's LORRI camera (short for Longe Range Reconnaissance Imager) were combined with the color data from the Ralph instrument to create this view. 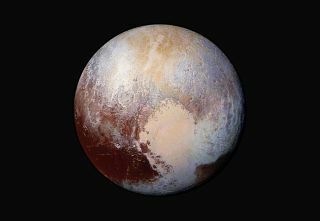 Pluto's heart-shaped region was named Tombaugh Region in honor of the late astronomer Clyde Tombaugh, who discovered Pluto in 1930 while working at the Lowell Observatory in Flagstaff, Arizona. NASA will unveil more new photos of Pluto from New Horizons later today at 2 p.m. EDT (1800 GMT) during a press conference at its headquarters in Washington, D.C. You can watch the Pluto webcast live on Space.com, courtesy of NASA TV.